When to get rid of his Dream Car…when he is gone. – Emily L. Pittsford….Author of "A Most Incredible Witness"
When to get rid of his Dream Car…when he is gone. It seems to me that no one is an expert in anything. Yet as any author will tell you. We do tend to be of an observant breed. And how does this help unless we share with you what we observe? So on Facebook the other day I couldn’t help but notice that a friend of mine let go of her husbands dream car. Judy and Ray had been married almost 40 years when he was diagnosed with throat cancer. 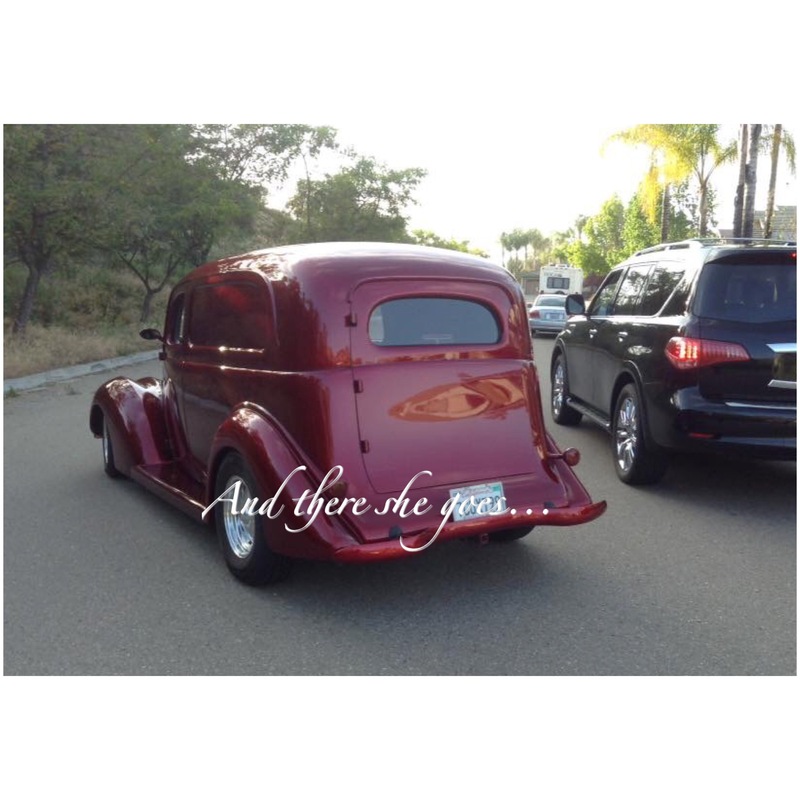 While he was going through extensive chemo treatments, this wonderful woman…his wife went and found him a vintage dream boat of a car of his. A red 1937 Ford sedan delivery. It was in perfect condition and there was travel involved to get it! Well, unfortunately this dream car became a constant reminder that he was gone. But when do you get rid of things our loved ones left. I was faced with the same challenge when our son Tim died. I too had purchased his dream car for him. He had gotten a scholarship to a nearby university and I wasn’t all that thrilled with him going to Purdue, which is quite the distance. So I sweetend the deal and we went and got him a silver Eclipse. So to see his car in the driveway was obviously painful. In my years of observing others as they go through this process I find…there is no script. But what is indicative of where we’re at in the grieving process is the deceased personal belongings. I remember watching my grandmother at her husbands funeral. Now granted, he wasn’t a nice man. In fact at one point he almost threw my great grandmother through a sliding glass window. (The glass broke the fall) I suppose meeting him in a mental hospital wasn’t a good start. So I watched her, who rarely did this, have a glass of wine at his funeral. So…without much hesitation I would say she never grieved. His clothes were probably already donated to a thrift store by this time. She went straight to acceptance and in fact seems to be happy about his death. Then there’s the opposite reaction where one make shrines. Especially with the loss of our children. You hear of stories, or see in the movies where their rooms aren’t touched for years. As its just too painful to take anything down. For myself, regarding our son that passed away, we have His pictures here and there. But I don’t think it’s any more than I would have normally. Other than the black box of sympathy cards. That one is still on a hutch. I will know when it’s time to retristribut it…but not today. I have also noticed that when at estate sales, I can always tell how far along someone is in the grieving process by their prices. Honestly, they will say when I ask them a price “well, that was my mothers”. As much as I have great compassion for their loss, I probably won’t spend more on something because their mother owned it. But to them it still means the world. When they have had more time to process the pain of loss, they are ready to move things along as now they see the merchandise as just things. And not the person. They still have the memories, even without the item. So, as I watched Judy let go of Ray’s car. The car he was so excited to get. The car he drove to car shows with, was the envy of his car friends, decorated for holidays was now going to be the great find for someone else. As for us it took us over a year. Thankfully his cousin wanted the car, so we sold it to him. However…that means at family events there sits that silver baby. I have yet to not take a deep breath of surprise when I see it. But a happy it is still in the family. And I thought…how great to see her continuing to move on with her grieving process. Allowing herself to be sad, to acknowledge the pain. But not hold onto things to try and make it alright. As that’s what a grieving process is. Releasing. Which takes strength and courage. To read more about the grieiving process I believe this one is very helpful…Own It! And so I applaud her…as I know it wasn’t easy to watch another piece of her husband drive away. If you are in a grieving process you will know when it’s time to let go of the physical. As I can almost guarantee you, their things will go as you let go of the pain. Next Post What I learned about Mother’s Day after losing our son.